There comes a time when what's brewing under the surface breaks through. For me the breakthrough is the need for a little Twitter Vacation. I love Twitter, the friends I have on Twitter and how connected I am through it, with people in Milwaukee and around the world. Now, I'm not going to leave Twitter forever. 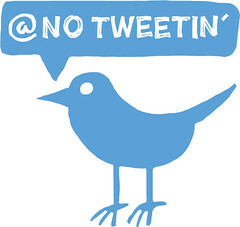 Rather, this will be a 3 week experiment off of the service to see how being Twitter-free effects me. I've sensed lately that I need to take a step back. I've caught myself constantly checking my Twitter mentions, working very hard to tweet something of value and scanning my live feed in Tweetie for something, anything interesting to read. While that's typical Twitter user behavior, I've felt this incessant attraction to scanning random tweets and re8-2010plies at all times to be distracting my focus from more important things in my life right now. As you may know, we've added a baby girl to the family, which is wonderful and understandably, quite time consuming. Couple our 3 month old baby girl with a stack of personal projects and plans to be made for SXSW Interactive in March -- it all adds up to a pile of important things I must focus on. So, as an experiment, as of February 1, 2010, I'll be leaving my Twitter feeds sit idle while I catch up on everything else in my life. I'll come back in 3 weeks, on February 22nd and report my findings here. Week 1 Update (Feb 8, 2010) — My first week of Twitter vacation has been an interesting experience. On more than one occasion I've wanted to share an idea or a photo, with Tweetie on the iPhone, only to stop myself. I've missed reading tweets from friends I follow. After reading Michael Lopp's excellent post, A Story Culture, I'm understanding how much I enjoy weaving stories together from 140 character snippets of information. In some ways it's like stitching stories together while listening to the radio. I have also noticed an increase in productivity. I'd expected this might happen however. Those little distractions add up over time, so whatever plan I set for myself after the 21st will include limits on usage. Doom and gloom. Meltdown of the global economy. Real estate prices dropping, layoffs, businesses closing and more bad news bombards us daily. 2008 was a rough year and 2009 is off to a rocky start. These are challenging times. In spite of the bad news around us, I've decided to focus on the positive. To focus on the opportunities in this new year and not let the negativity dominate my outlook or perspective. For me, this begins with SXSW interactive in Austin, Texas, March 13-18, 2009. One hugely bright spot in 2009 is the honor of being the Official Sketchnoter to SXSW Interactive. 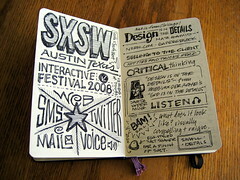 In 2008, my first ever SXSW, I used my Moleskine pocket sketchbook and G2 pen to live capture several of the panels and sessions in sketchnote form. At the time I was capturing the event for myself and the small band of followers who enjoyed my work from SEED 1 and SEED 3 conferences and other events I'd captured in 2007 and 2008. What surprised me was how popular the SXSW 2008 sketchnotes became. Just a week after posting the sketchnotes, they appeared on 80+ sites, including Daring Fireball, R.BIRD, FrogDesign, Jason Santa Maria and Boing Boing! I'd love to meet new people at SXSW, so if you're attending and would like to talk over coffee at the event, drop me a line with SXSW in the subject line and say hello, and if you like, follow me on Twitter. I'm attending the 2009 Avalonstar Bowling Extravaganza on Saturday, March 15th, and my co-conspirator Brian Artka and I are organizing some kind of small gathering at an Austin location during SXSW Week, we'll announce soon. Be thankful for what you have in your life. Be ready for opportunities. Circumstances can bring you down — don't let them ruin your outlook. Stay positive!